Smooth and soft hair is loved by all. Here are a number of easy and simple techniques to make your hair smooth naturally. Improve the texture of your hair and make it healthy by using these tips at home. 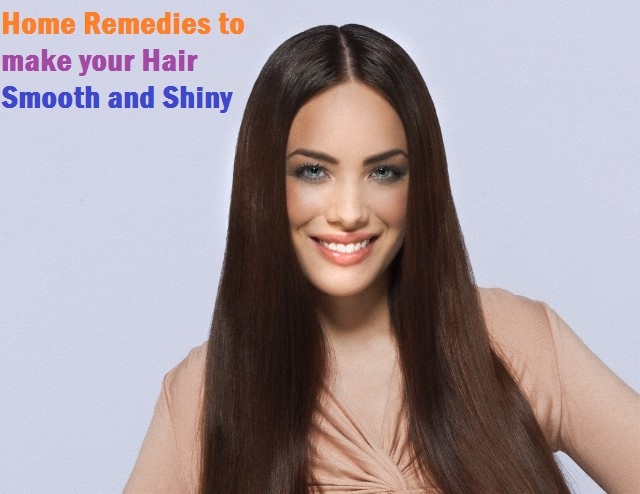 Here are a few home remedies to make your hair smooth. Using mayonnaise every week conditions your hair deeply, and hair growth is stimulated. Add 2 teaspoons of avocado to a cup of mayonnaise and mix well. Start from the roots and apply on your hair. Use a shower cap to cover your hair, and leave it for an hour. Wash off with shampoo and cold water. The enzymes in Aloe Vera help in healthy hair growth. The gel moisturizes your hair and keeps it soft. Take an Aloe Vera stem and take out the gel from it. Add water and dilute it. Apply the gel all over your hair strands. Use a mild shampoo to wash it off. Using an egg pack cures damaged and dry hair. It makes your hair shiny and smooth. The proteins and nutrients improve hair texture and make your hair bouncy. Take an egg and beat it in a small bowl. Add cream, olive oil, and a teaspoon of honey to it. Mix all the ingredients well and make a smooth paste. Apply the pack all over your hair. Leave it on to dry, and then ash off using shampoo and cold water. Glucose, sucrose, and fructose contained in bananas are good for moisturizing your hair. Flaky, itchy and dry scalp gets soothed, and frizz is also reduced. Adding yogurt to it enhances all effects of the banana. Your hair becomes smooth and moisturized. Mix 2 teaspoons of yogurt to it and blend well. Make a smooth paste and apply all over your hair. Leave it on for 45 minutes, and then wash off using a shampoo. Use apple cider vinegar to rinse your hair. It helps to maintain the pH level of your hair, and also cleanses your hair. Use vinegar to rinse your hair to close the cuticles and make your hair soft, smooth, and shiny. Take a cup of water and dilute a quarter of a cup of vinegar in it. After washing your hair, use this mixture as a final rinse. Let it stay on your hair. Massage your head with hot oil at least once every week. It helps in making your hair soft, silky and smooth. Moreover, it is a great relief o de-stress yourself. Coconut oil, olive oil, jojoba oil, sweet almond oil, rosemary oil, lavender oil, and thyme are very effective oils which you can use for the hot oil massage. Combine all these oils to use on your hair. Massage your hair well, and use a warm towel to cover your scalp. It helps the oil penetrate well in to your pores. Leave it on for about 20 minutes. Use a mild shampoo to wash it off. Along with the above home remedies you can also consider these simple to follow tips at home. You must use a blow dryer only if it is really necessary. It is always best to naturally dry your hair. While using blow dryers, use the cool setting sonly. This causes less damage and even makes your hair cuticle soft. When you select a shampoo, make sure it matches your hair type. It makes your hair clean, soft and smooth. Washing your hair twice using the shampoo is very effective. You can also make your own shampoo using amla, reetha, and shikakai. Dry and boil them, and rub well on your hair. You get a soapy solution. Washing your twice every week using this homemade shampoo gives you shiny and smooth hair. Wet hair must never be combed. It must first get dried before you comb. When you start combing your hair, start from the ends. Slowly, move upwards towards the crown. Combing from the top of your head can cause your hair to break and get damaged. It also causes frizzy hair. You must use a good conditioner to condition your hair. It makes your hair silky and soft. A good idea is to leave behind a little bit of conditioner in your hair after washing. It makes the outer surface of your hair smooth. Using leave-in conditioners and serums gives your hair a frizz-free and smooth look. People with curly hair benefit specially by using leave-in conditioners. Using hot water on your hair makes it rough and frizzy. Your hair cuticles get closed and your hair gets smooth if you use cold water. It also gives the right volume by making your hair de-frizz. Using a curling iron, perming rod, or straightener style your hair instantly. They may be harmful for your hair if you use regularly. The heat harms your hair, and makes it frizzy and coarse. The natural sheen of your hair is lost. In case you need to use these tools, use a spray or serum that protects your hair from the heat. It reduces the damage caused by styling. An envelope is formed over your hair tosave it from the heat. Sodium Lauryl Sulphate or Ammonium Laureth Sulphate are contained in some products. They are very harsh on the hair, so you must avoid such products. Chemicals cause hair fall and thinning. Trimming your hair from time to time helps remove split ends. Every 4 to 6 weeks, trim the ends to give a damage free look. Split ends make your hair look dull. All these remedies make your soft and smooth naturally. Moreover, they have no side effects.